It was Saturday night, and Happy Meal and I found ourselves in Oxnard, CA. Naturally, we sought out the best reviewed burger joint in town. 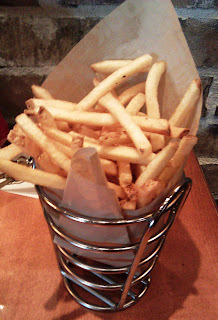 Hook Burger Bistro was well liked by the reviewers on Yelp and Urbanspoon--really well liked. This was the upscale, fast-casual offering by Habit Burger Grill founders Brent and Bruce Reichard. They were going for "fine dining on a bun"--that was from their website. This location also served wine and beer. Parking was free and plentiful in the strip mall lot. The process was to queue up, place an order with the cashier after making a selection from the video screen/menu, find a table, and wait for the meal to arrive. We ordered a couple of the Prime Burgers ($4.75) with cheese ($.75--weak), fries, and a couple of drinks (soft drink and a shake) for a pre-tax total of $19.15. The drinks arrived within 2 minutes--the fries arrived within 3 minutes--the burgers were at our table in 4 minutes. They were fast! The term "bistro" was taken by the French from the Russian "bistra", which means.....fast. Hook Burger Bistro embraced the concept of speedy service with abandon. I am sad to report that the speed came at the cost of everything else. There was a real issue with cleanliness. 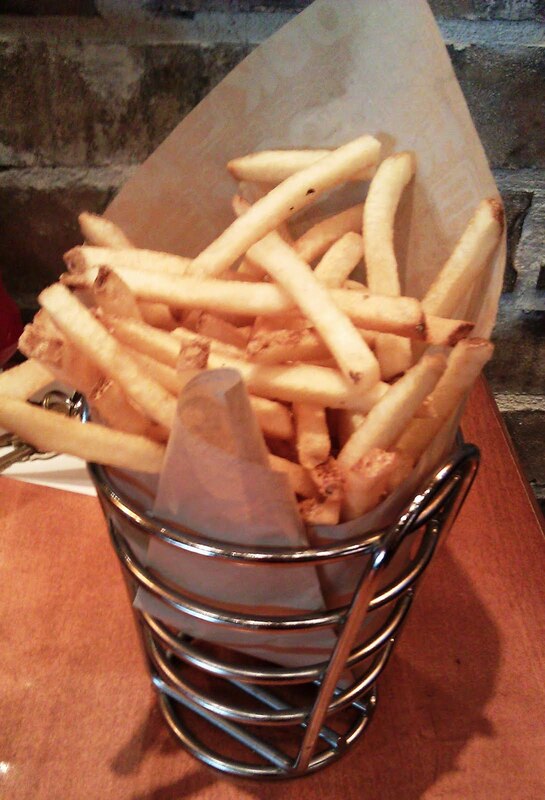 The stainless steel baskets that bore our burgers, and the plates that our toppings arrived on, were dirty. The undersides of the baskets and plates were gummy, greasy, and covered with bits of food. This was utterly unpleasant. It appeared that rather than running the service items through a dishwasher or a sink, the top surfaces of these items were simply wiped down. I was thankful that there was no silverware and that the beverages arrived in disposable cups. The Beef: The burgers were 5 ounces of USDA Prime Chuck. The patties had a satisfying beefy flavor, but that was the entirety of what the beef brought to the table. The 80:20 Chuck arrived pre-ground. The beef had just enough moisture to avoid dryness, but it was, by no means, juicy. The Seasoning: The thin burger patties were very lightly salted on the grill/griddle, and there was no seasoning in the blend. The seasoning was barely noticeable on the palate. The Sear: In spite of being over-cooked, the sear was only half present on our cheeseburgers. The burgers appeared to have been first grilled and then seared on the flat-top. There was a faint hint of carbon from the bit of char that was present on the patties. The Preparation: At one time, Hook Burger Bistro ground their own beef and cut their own fries. The manager informed me that these practices slowed things down, so the beef arrived pre-ground, and the fries showed up frozen in bags. The patties were uniform and thin, so it was safe to assume that the burgers arrived pre-formed. The burgers were cooked to Well-Done rather than the Medium, which had been requested. I was informed that they automatically cooked their burgers to Medium unless otherwise requested. The fact that the burgers were aggressively over-cooked was puzzling, since Medium was the default at this restaurant. Still, the cooking process melted all of the collagen in the beef, so at least it developed some flavor. 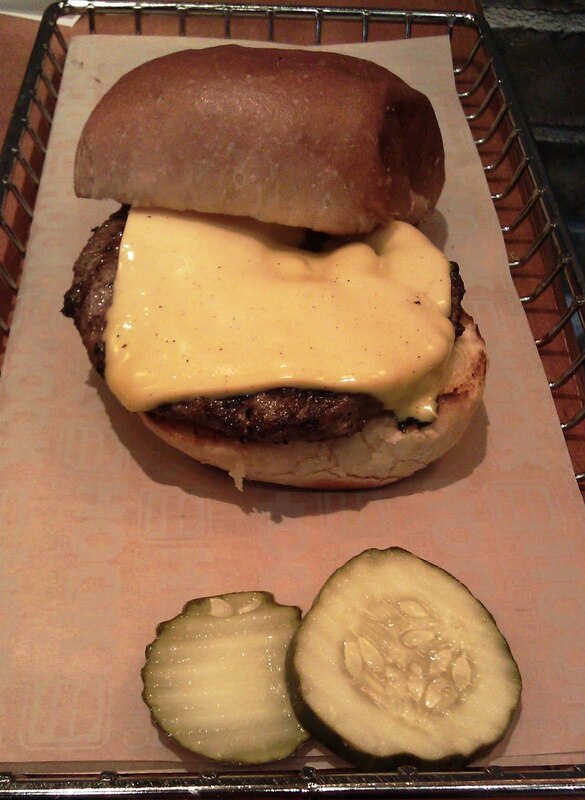 The Cheese: The American cheese was completely lost due to the dryish, stale bun. 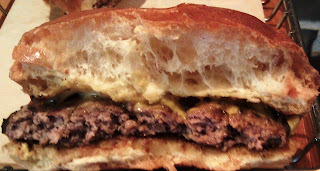 The Bun: According to the manager, the brioche buns were sourced from Puritan Bakery. Their website suggested that the buns were sourced fresh daily from Ethnic Bakery in Santa Barbara, CA. The buns were on wrong side of stale. The top bun of my cheeseburger had a leathery crust and was relatively dry throughout. The bottom bun was on the hard side. It peeled away the top half of the top bun to try and get a sense of the dish with a proper bun. The buns were mildly toasted and neutral in flavor. Had they not been leathery and dry, they probably would have been fine. 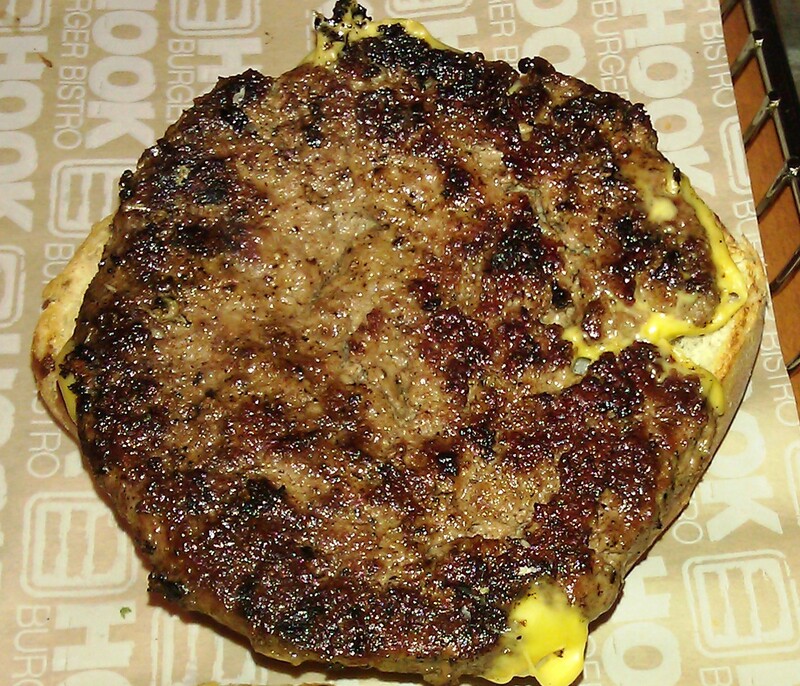 The Meat To Bun Ratio: The stale bun dominated the thin burger patty, and it made the cheese completely moot. The Fries: Oof. It was no wonder that the fries arrived so swiftly. They were under-cooked. As a result they were pale and rubbery. They were also dramatically under-seasoned. The Toppings: The garlicky pickles were crisp and delicious. The tomato slices were of average quality. The Iceberg lettuce was shredded. The burgers at Hook Burger Bistro were in the backyard barbecue range in terms of flavor. Sadly, the plates and baskets were dirty; the buns were stale; the fries were undercooked; the burgers were cooked too hard. Happy Meal liked his shake, though. This was a failed attempt where fast food attempted to reach for upscale. I would have been happy to wait a few extra minutes for clean plates and food that was prepped in house. The Reichards should have stopped with the perfectly adequate burgers at the Habit Burger Grill chain. I have never been tempted to update my vaccinations after a trip to a Habit Burger Grill. Fine dining on a bun did not happen at Hook Burger Bistro...that would have required actual fresh ingredients and clean plates. Burger Review : The burgers tasted fine, but the cleanliness issues and poor preparation made this a "never again" experience. Is this the same Hook Burger chgain found in Burbank? I believe so. I have heard that they do a much better job. I may have also just been there on an off night. A lot can change in a year. Perhaps they improved...perhaps I was there on an off night. I stand by the review of the burger that I ate, but I am happy for you and your fellow diners that you have been getting good food at Hook Burger.